When you are going out for a hunt you need a number of things. When it comes to a set of binoculars you need a balance of clear details, enough magnification, light enough weight and small enough size. 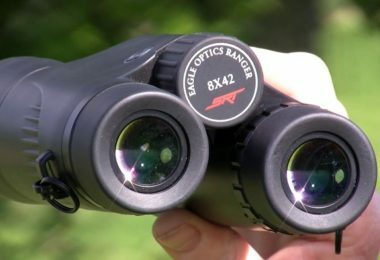 While it might seem like that list is hard to come by, but the best 10×42 binocular on the market today will make you see that it isn’t. 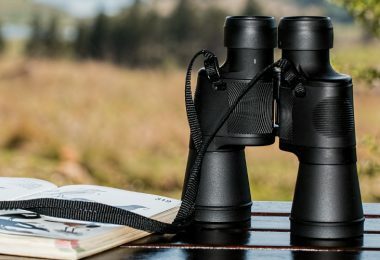 You may not believe that a single set of binoculars can cover everything that you need for both hunting a bird watching we feel when you have seen the list that we have compiled you will make you change your mind. With that thought in mind let us walk you through our top picks. But no round up of this style would be complete with a list of high-quality products. Instead, we have also highlighted some of the important features that you should consider in your binoculars. Buying the best binocular does not mean you have chosen the right pair for your specific needs. Certain models have a design suitable for only hunting, astronomy or birding. To help you, we have important tips available here. The tips will help you make the best choice when selecting your new pair of bins. You might have heard the bigger the binocular the better it is for hunting. The fact is it is the opposite as a 7x or 10x offers you enough magnification. The problem with higher magnification binoculars the less steady the image. After a long day of trying to find your target, holding a high magnification optical is tiring. This is where comfort plays a big role and if you need a higher optic it might be best to choose a spotting scope. There is also the issue that too little magnification could lead to not being able to see enough detail. You will often find that the 10x magnification is the sweet spot for hunters. Choosing a 40 mm to a 42 mm objective lens is suitable for hunting and even birding. The larger the objective lens is, the more detailed the object becomes. Here you need to consider your budget. Did you know, buying a pair of binoculars with a 50 mm objective lens are more expensive? There is a good reason for this. In addition to the budget, weight becomes another consideration. The larger the lens the more weight you will find yourself carrying. While the thought of trimming down the weight you are carrying might make you want a smaller set, going much smaller than 42 mm will not provide enough detail. The field of view helps you to visualize the distance when using your binoculars at a 1,000-yard distance. The smaller the number the narrower the image and the opposite happens with a higher number. You need to consider the magnification. The image will become smaller with the FOV when using the magnification. If you plan on using the device in open areas a binocular with a higher FOV is better. Whereas targeting fast-moving game does not need a high field of view. This becomes a trade-off that only you can decide what is best for. You’ll need to take your particular shooting style into account as well as how this fits in with other specs that you are looking for in a quality pair of binoculars. With the magnification and objective size, it determines the exit pupil size. The role of the exit pupil tells you how much light comes through to your eyes. To work this out the manufacturer has divided the magnification size by the objective size. With a higher exit pupil, more lights transmitted through the device. You will also need a larger exit pupil for shooting in lower light situations, but at a certain point, a larger exit pupil won’t help. Once it gets larger than a human pupil can go, you will get no added benefit. There are two prism designs, the Roof and Porro prisms. 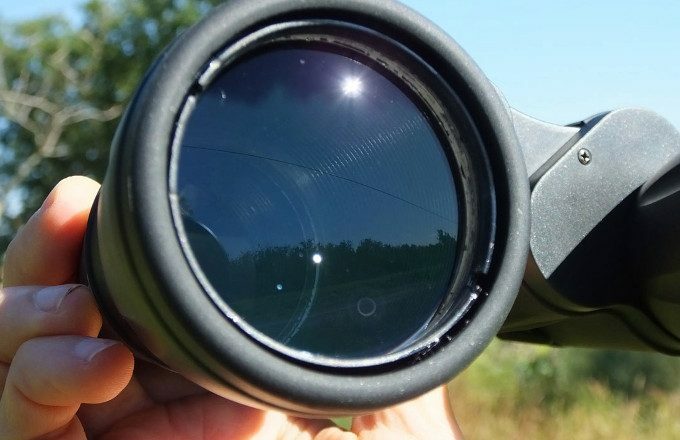 Many people find the Roof prism more usable as the binocular is lightweight with a slim design. This design reflects five times more light and they are more expensive. When buying a Porro prism design you may find the binoculars bigger as it needs a larger body. The light reflected is only four times. Moreover, the prisms not in a direct line with the eyepiece and they are affordable to buy. Other features you can consider is the focus type, eye relief, optical coatings and image quality of the binocular. Focus type – you can buy the device with a central focus or individual eyepiece. For medium to long distance, viewing the individual focus is superb. For viewing game close, a center focus binocular is perfect. Eye relief – if you wear eyeglasses this is an important feature to look at. This defines how far you can use the binoculars away from your eyes and still be able to view the image. The best option is to choose a model giving you a 14 to 15mm eye relief. Optical coatings – the only thing the added optical coatings does it reduce the light reflection. You can buy the unit with fully multi-coated, fully coated, or multi-coated. The better the coating on the glass the higher amount of lights’ transmitted. Image quality – this is another important thing to consider, especially if you use your binoculars for hours. The important thing is to buy a pair of binoculars with rubber coating, waterproof, and fogproof features to use outdoors. With the above-mentioned features combined with a durable device, you can enjoy hours of viewing out hunting or just observing nature at its best. 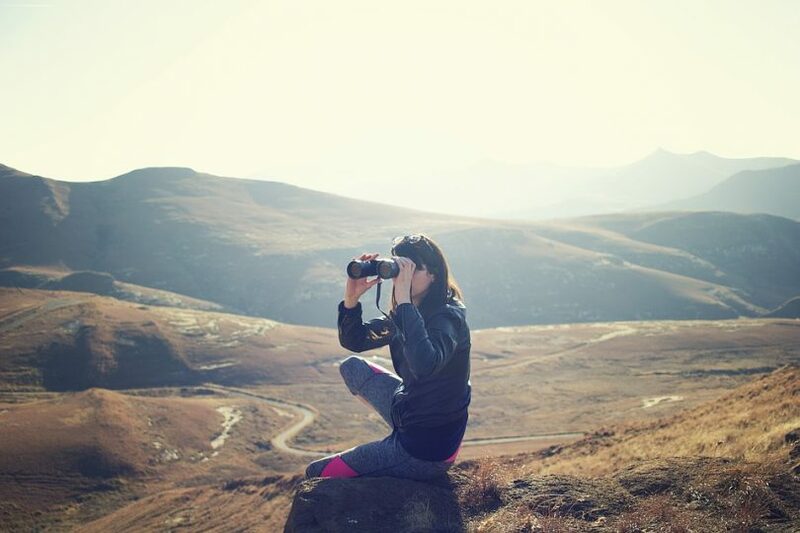 In our selection, you can find eight different 10×42 binoculars suitable to use in any type of outdoor mission. Enjoy from hunting to bird watching, with these fine pieces of equipment available here. 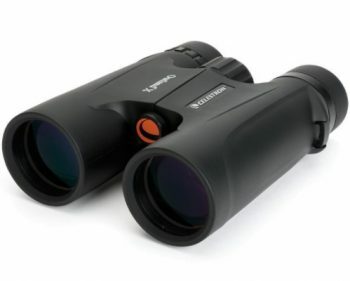 Description: With the Celestron 71347 Outland X Binocular, you will be able to see the outdoors in a new way. Whether you enjoy watching sports events or planning a trip abroad this is one of the top ones you can own. With BaK-4 fully multi-coated glass, you can observe nature with an enhanced color. Use it in rough and tough terrains as the rubber armored exterior can handle anything outdoors. From fog to rain you can feel assured this set of binoculars will not become defective. The manufacturer has made the device all weather resistant from waterproof to fog proof. For precise focusing, it has a large focus knob with twist-up eyecups to adjust for the best eye relief and a full field of view. Pre-attached to the device, it has comfortable traps making them ready to use out of the box. You receive the binoculars with semi-attached objective lens covers. Tired of holding the unit with the tripod adapter threads available you can easily mount it on a tripod. The optic is lightweight and includes great accessories such as the protective carry pouch, wide strap, and a no-fault lifetime warranty. Other standout features are the roof prism design, linear 293 feet FOV @1,000 yards, 4.2 mm exit pupil and near focus at 13 feet. If you are an eyeglass wearer, you will be more than pleased with the 14 mm eye relief. Related: When you are outdoors or out hiking the mountain a pair of binoculars could become heavy to carry. Why not mount your device onto the OP/TECH USA Harness for ease of use. 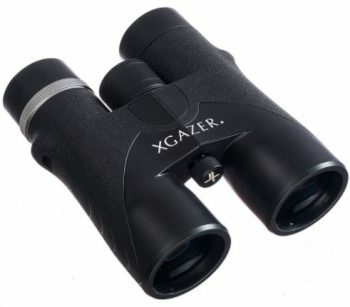 Description: The Xgazer Optics HD 10×42 Professional Binoculars offers you the best viewing experience with any trip you plan. For long-range viewing, you cannot go wrong with the 10x magnification and 42 mm objective lens. Enjoy venturing through the jungle with unforeseen rain as the binoculars waterproof and fogproof. The unit’s nitrogen filled and has an FMC coating and suitable to use in temperatures ranging from -45- to +45°. For eyeglass wearers, the twist-up eyecups and 15.6 mm eye relief is more than welcome. Furthermore, it has an adjustable interpupillary distance with a close focus of 6.56 feet. There is a diopter adjustment ranging from -4D to +4D. You receive a travel set made up of this model from Xgazer, a neck strap, carrying case, with a cleaning cloth. The device weighs 14.46 ounces making it lighter than the Celestron 71347 models. This amazing piece of equipment will make the world look brighter with superb color clarity. For ease of use, the exterior of the binocular has a non-slip grip and durable armored structure to withstand any knock. The zooming functions straightforward to use by twisting the lenses for a clear view. Moreover, to top it all you receive a lifetime warranty with excellent customer service. Related: We know this is the top option available online with exceptional accessories included. However, there does come a time when you need to clean your optic lenses and the Orion Deluxe 6-Piece Cleaning Kit can be quite handy. Description: Now for something, a little more expensive than our previous reviewed 10×42 binoculars. 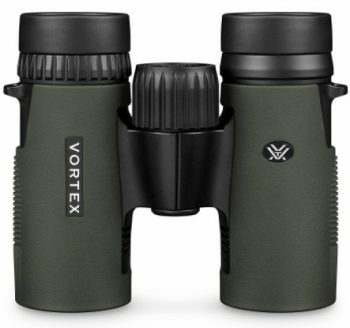 The Vortex Diamondback Roof Prism Binoculars has undergone a complete change. This leader in the world of optics has made the device with short-hinges with a sleek new look. They have included a new optical system for stunning views when used in low-light conditions. Whilst the wide field of view can cover loads of ground to find your object. 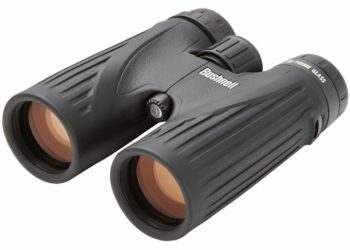 What makes these pairs of binoculars stand out from the rest are the o-ring seals preventing dust, debris, and moisture from entering the optics. The glass has a multi-layer of prisms for viewing objects in a bright and accurate color. With the fully multi-coated glass, it helps with light transmission and the dielectric coating gives you a clear view of the image. The device is waterproof and fog proof making them great to use for hunting and nature observation. The exterior of the binocular rubber armored and it has a non-slip grip. The eyecups twist up and down for eyeglass wearers and it has a center focus wheel adjusting both the barrels simultaneously. Furthermore, you can adjust the optic to suit your eyes with the diopter found on the right eyepiece. The Diamondback weighs 21.4 oz and you will be pleased to hear you can mount it to a tripod. The exit pupil is 4.2 mm and it has a close focus of 6.7 feet. Related: Although the Vortex new Diamondback addition comes at a steep price, you do not receive loads of extra accessories included. The binocular is on the heavy side and best to buy yourself the Vortex Harness Strap if you are planning a hunting trip. 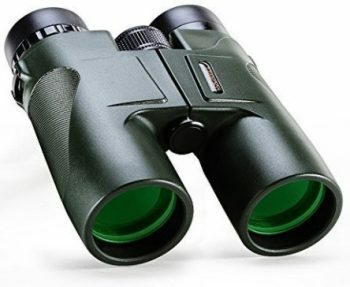 Description: Astonishingly the Leupold 119198 BX-1 McKenzie Green Ring Binoculars is much cheaper than the Vortex binocular mentioned earlier. Not only is it loaded with amazing features a leader in the best optics for shooting and wildlife observation has made it. With the McKenzie, you can get up close and personal with the binocular. The binoculars waterproof, fog proof and gives you a linear field of view of 315 feet at 1,000 yards. 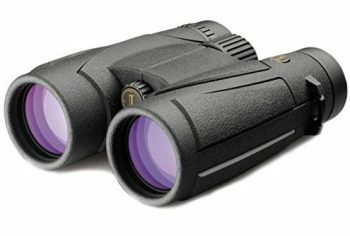 The binocular weighs 22 oz and is 5.8 inches in length. You get a 4.2 mm eye relief with a close focus distance of 10 feet that is amazing. The exterior of the device is armor coated with an ergonomic design for the best grip. With the large central focus dial, you can easily dial in on objects in the distance and great for spotting animals. Leupold has constructed the binocular with BaK-4 prisms that are fully multi-coated and phase coated. The eye relief of 13.75 mm with the twist-up eyecups is perfect for eyeglass wearers. The other standout with this fine piece of equipment is the diopter focus paddle, allowing you to focus the device for differences between your eyes. Included with your purchase you receive extra lens covers, a carrying case, cleaning cloth, and the Leupold Gold Ring Guarantee. Related: The Leupold 10×42 binocular is a bit on the heavy side to carry around all day. To solve this problem we suggest you buy the Leupold Quick Release Binocular Harness for a steady hand and comfortable use. Description: The Uscamel Binoculars Compact for Bird Watching binoculars designed for the avid birder, but suitable for the hunter as well. The device has a magnesium alloy body with BaK-7 prisms. The glass has both phase and dielectric coatings. On the right eyepiece, you have a diopter adjuster to adjust for differences between your eyes. For outdoor use, the Bino is fog proof to keep dust, moisture, and debris from entering the device. The exit pupil is 4 mm and not as high as in our previous models available and offers you a 303 feet field of view. With the 42 mm objective lens, the binoculars perfect to use in bright light. The prisms only multi-coated with a green film to give you image clarity and the best resolution. It also has a center focus system with a Porro design. The other great thing is the binoculars waterproof as well. Included with your binocular you receive a lens cloth, shoulder strap, and carry case. Related: The outstanding thing about the USCAMEL is you can mount it to a tripod for a steady hold. We suggest you buy the Bushnell Universal Tripod Mount to use with your tripod. 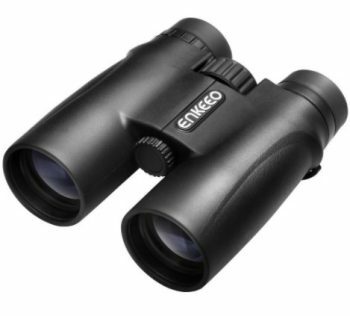 Description: If you need an affordable long-range pair of bins for different uses, the Enkeeo 10×42 Roof Prism Binocular will not disappoint you. With the Enkeeo, there is no concern about eye relief as it offers you 13.6 mm with a twist it up or down eyecups. This is great for eyeglass wearers. The optic consists of high-reflective BaK-4 prisms for the best light transmittance to see objects brighter and clearer. On the exterior of the device, it has grooves where your thumb fits while holding and the case is rubberized and splash proof. The device is not lightweight and weighs 22 oz, but still capable of using it for concerts, bird viewing and more. Included with your binocular you have four easy-to-use caps that protect the lenses when not used. You receive a neck strap to rest the device around your neck and with the carrying case to store it for traveling. When using the binocular you get a 304-foot field of view with a 13.6 mm eye relief. Related: For the price, this is the top 10×42 binocular you can buy. However, no matter how affordable or expensive the binocular is you need a good cleaning kit to keep it in tip-top shape. We suggest you try the Orion Deluxe 6-Piece Cleaning Kit. 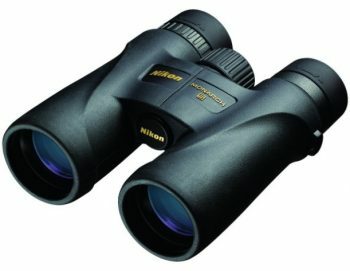 Description: If you have the money to spend, the Nikon 7577 Monarch 5 Binocular comes at a high price. The binocular made with premium extra-low dispersion glass to give you a sharper image with an exceptional field of view of 288 feet. The eco-glass lenses fully multi-coated for a high light transmission and equipped with turn-and-slide rubber eyecups. 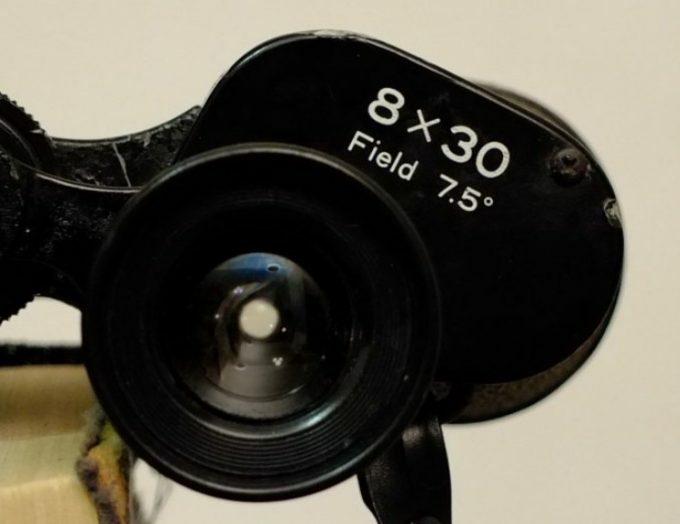 For focusing the optic, it has a central focus knob with flip down lens caps. You can use the binocular outdoors when it rains, as it is fog proof and waterproof with an armored body for durability. Nikon used dielectric high-reflective coatings multilayered on the prisms. You get an excellent 18.4 mm eye relief and the best 10×42 binocular for eyeglass wearers. The device is lighter than the models reviewed here and weighs 21.6 oz. However, when compared to the Xgazer not as lightweight as one would think. For color, fringing nothing beats the Nikon 7577 Monarch 5 Binocular as the ED glass helps to correct chromatic aberrations. With the added, weight the pair of binoculars sleek and easy to grip in the hand for hours. You get a close focus distance of 7.8 feet with a 4.2 mm exit pupil. Included with your purchase for the price you receive the binocular, eyepiece lens caps, neck strap, and instruction manual. Another standout is the Nikon no-fault repair/replacement policy and the comfortable viewing with the high-eyepoint design. Related: The Nikon may not be as heavy as the other 10×42 binoculars reviewed here, but we recommend you try the Vortex Harness Strap if you are planning a long walking trip. 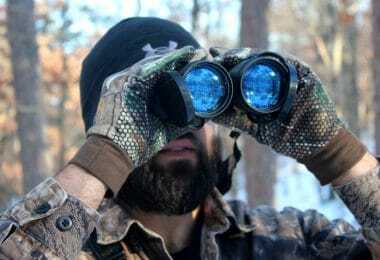 Description: Are you searching for the best binoculars to use on your hunting trip? Place your hands around the Bushnell Legend Ultra HD Roof Prism Binocular model. Bushnell offers you superior light transmission with an ultra-wideband anti-reflective lens coating. With the ED glass, you can see wildlife in true color and clear from a distance. With the water-repellent coating on the glass, it keeps moisture away and you can use the binocular in the rain or snow. For a maximum light transmission, the anti-reflection coating helps to give you optimum brightness. The device has a magnesium chassis with a soft grip and ultra-wide field of view with an exceptional eye relief and locking diopter. You get a 4.2 mm exit pupil with a 15.2 mm eye relief. The optic consists of BaK-4 prisms with a close focus of 6.5 feet and a 340-foot field of view. Included with your purchase you receive a neck strap, soft carrying case, and microfiber lens cloth. The other exceptional thing is the lifetime warranty. Related: Compared to our other 10×42 binoculars reviewed here, this model has a heavier weight of 24.7 oz. You may just need something more stable to keep it secure when walking around in the bush. We recommend you look at the Bushnell Deluxe Binocular Harness. We have finally reached the end of our roundup of the available binoculars on the market for you to buy. 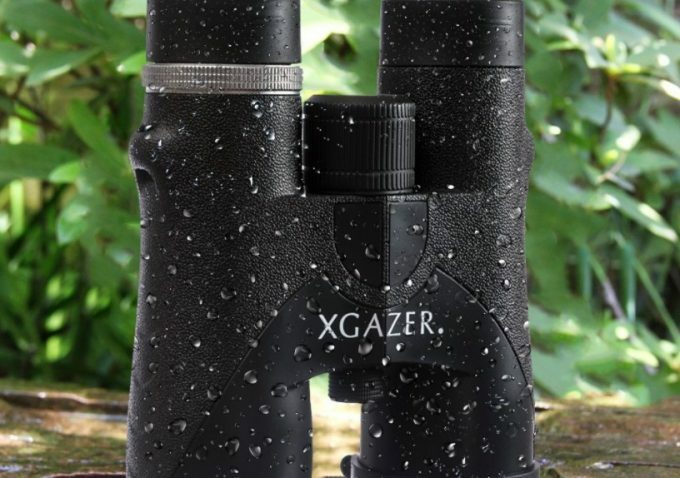 You must agree the Xgazer Optics HD pair comes at an affordable price. Not only is it lightweight compared to the other models available, but also packed with outstanding features. 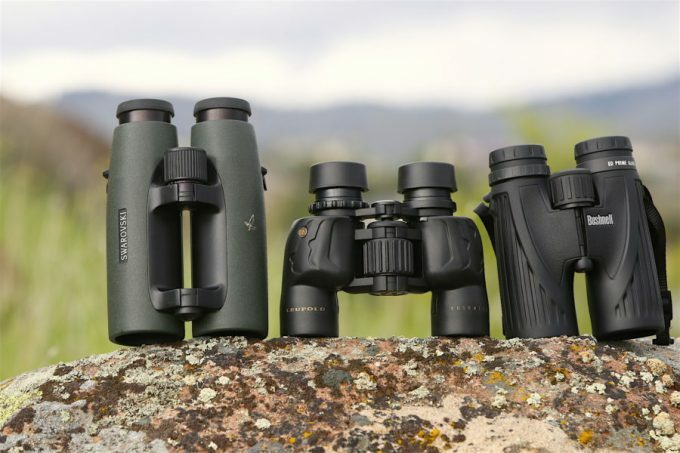 If you do have the money to spare the Leupold, Vortex, and Nikon are in the top binocular range when it comes to using premium glass. In addition, if you need something less expensive than the Xgazer the Enkeeo received excellent feedback from customers who have bought it for their outdoor use. Moreover, if you need the perfect hunting companion the Bushnell Legend offers you a large field of view and has a stunning design. The only downside it is the heaviest binocular available in this selection. If you think we have overlooked a product in the 10×42 range, please leave your response in our comments box below. 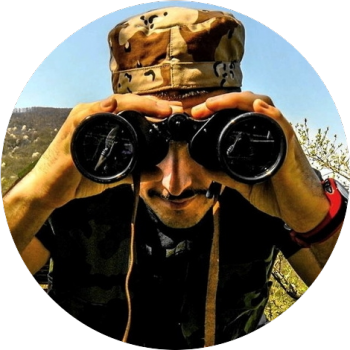 We hope our review and tips help you to find the best binocular available for your specific needs.